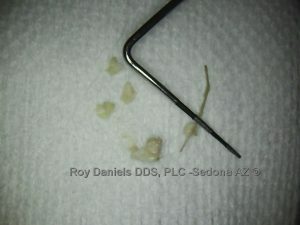 Food stuck between teeth gums causing pain? But do you suffer from food stuck between teeth much worse than other teeth and on a frequent basis? For example, are two of your teeth just far enough apart to constantly trap food? Do you even avoid chewing on that side of your mouth in an attempt to minimize the frustration of getting food stuck between your teeth? While that may be a quick fix, it’s not a long-term solution to the issue. The real question is – why does food get stuck between teeth in that location? 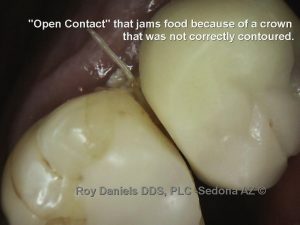 Food getting stuck between the adjacent teeth is sometime due to an “open contact”. 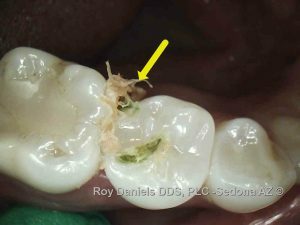 An open contact that allows food stuck between teeth and gums can be caused by the placement of filling or crown that lacks the proper shape. This is a common condition that Dr. Daniels can help correct. 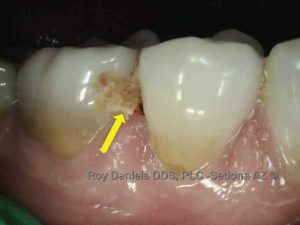 Cavities between and inside the teeth, cavities can trap food particles making it difficult to completely remove. Improper flossing can actually force material further between the teeth or the gum. Our dental hygienist is an expert at coaching our patients on the proper flossing and dental home care techniques. Periodontal disease may cause drifting and shifting of the teeth that can lead to gaps that collect food.